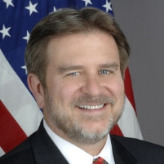 Charles L. English began serving as US Ambassador to Bosnia and Herzegovina in September 2007. English received a bachelor’s degree from Princeton University and studied international economics at the graduate level at New York University. English served as vice consul/economic officer in Panama City, Panama from 1978 to 1980; as an international financial economist in the Bureau for Economic and Business Affairs from 1982 to 1985; as economic officer in Athens, Greece, from 1986 to 1988; as special assistant to the deputy secretary from 1988 to 1989; and Special Assistant for Security Assistance and Arms Sales, and later executive assistant to the Under Secretary for International Security Affairs from 1989 to 1992. From 1992-1995, English was the Embassy Counselor for Economic Affairs in Budapest, Hungary, followed by the post of director for policy coordination in the State Department’s Bureau for International Narcotics and Law Enforcement Affairs from 1995 to 1998, where he coordinated efforts to promote police reform in Bosnia and Haiti. From 1998-2001, English served as Deputy Chief of Mission in Zagreb, Croatia. From 2002 to 2003, he served as the director of the Office of European Union and Regional Affairs in the Bureau for European and Eurasian Affairs. From 2003 to 2006, English served as the director of the Office of South Central European Affairs in the Bureau for European and Eurasian Affairs, where he was responsible for coordinating the State Department’s approach to relations with countries in the Western Balkans. English then served as the deputy director of the Office of Career Development and Assignments in the Bureau of Human Resources at the State Department. As deputy director, he was responsible for overseeing the assignments of all members of the US Foreign Service.